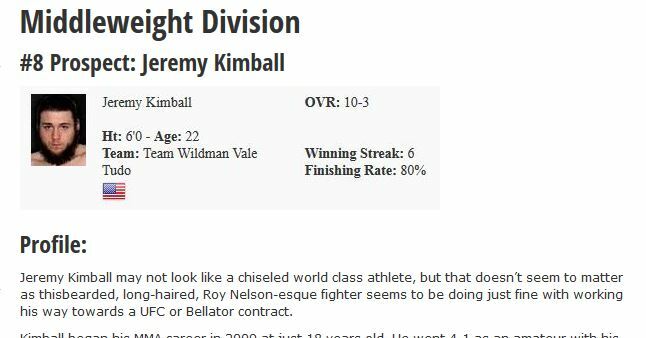 Jeremy Kimball may not look like a chiseled world class athlete, but that doesn’t seem to matter as thisbearded, long-haired, Roy Nelson-esque fighter seems to be doing just fine with working his way towards a UFC or Bellator contract. Kimball began his MMA career in 2009 at just 18 years old. He went 4-1 as an amateur with his only loss coming to future Strikeforce veteran Lumumba Sayers. Kimball turned pro in early 2010, but immediately struggled out of the gates, losing his first 2 fights via 1st round submission. Kimball was headed towards journeyman status before ultimately finding a way to unleash his KO power. Kimball won his next 3 fights, all via KO/TKO before moving on to take a close split decision victory over Artenas Young. His 4-fight win streak was soon snapped by IFL veteran Donnie Liles as Kimball lost via 3rd round armbar. Kimball bounced back by winning his next 2 fights via KO/TKO to improve his overall record to 6-3 overall. Kimball got the break he was looking for as he was matched up against TUF 6 runner-up Tommy Speer. Though he gave up some takedowns early, Kimball eventually rallied to win the fight via 2nd round TKO. Kimball was now on a few peoples’ radars following the victory and he soon followed that up with a decision victory over UFC veteran Drew McFedries. The fight was hardly a barnburner, but nonetheless, Kimball was able to defeat one of the hardest punchers in the sport. Thanks to his 4-fight win streak over solid competition, Kimball was signed by the Resurrection Fighting Allicance (RFA). Kimball ended up facing fellow prospect Chidi Njokuani in a catchweight bout of 180 lbs. Njokuani came storming out of the gates to easily take the 1st round, but just as Kimball had thought, his training in Colorado’s elevation paid off as Njokuani quickly ran out of gas and Kimball was able to earn the 2nd round submission win. Kimball originally started training at Team Wildman Vale Tudo, which is home to Thomas Denny and Bryan Baker. More recently, it seems that he has moved over to the Grudge Training Center, which is home to a long list of big show veterans and up and coming stars such as Brandon Thatch, Melvin Guillard, Justin Gaethje, and Brendan Schaub. Kimball’s move to Team Grudge may not be permanent, but it would be an ideal training environment for him that is rife with connections to the UFC. Jeremy Kimball has his own style and flare that should lend itself well towards gaining some fans and possible attention from the bigger promoters. After losing his first 2 career fights, he has gone 10-1 overall with recent victories over UFC veterans Drew McFedries and Tommy Speer. Signature wins like those will quickly get you noticed around the regional circuit. That seemed to be evident as the Resurrection Fighting Alliance (RFA) came calling and offered Kimball the opportunity to fight in their prospect-rich promotion. Kimball may not have elite athleticism, but he is very tough with an always-improving submission game and power in his hands. 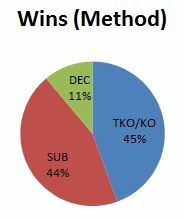 He is usually a slow starter and has commonly given away the 1st round only to storm back and win via finish. Kimball struggles at times with wrestlers, so there are tempered expectations for how he would eventually fair against top-level competition. Despite his shortcomings, you have to respect the fact that Kimball not only beat McFedries in a fight that solely took place on the feet, but also outgrappled Tommy Speer. Kimball has proven he can adapt when need be. McFedries and Speer are no longer in the UFC for a reason, but Kimball still has to be given some type of credit for beating two respected competitors at their own game. Beyond Kimball’s recent 5-fight win streak, his recent move to Grudge Training Center is truly a step in the right direction for possibly equipping him with the tools to succeed at the next level. Kimball is a very capable striker that moves well and has an excellent chin. He doesn’t have a whole lot of finesse to his game, but with the right training, Kimball should be able to round out his skills enough where he can keep his fights standing, and take advantage of his KO power. Kimball could stand to possible drop down to Welterweight if he got serious about his diet. The UFC’s Middleweight Division is stacked with high-level wrestlers and just bigger, faster athletes. 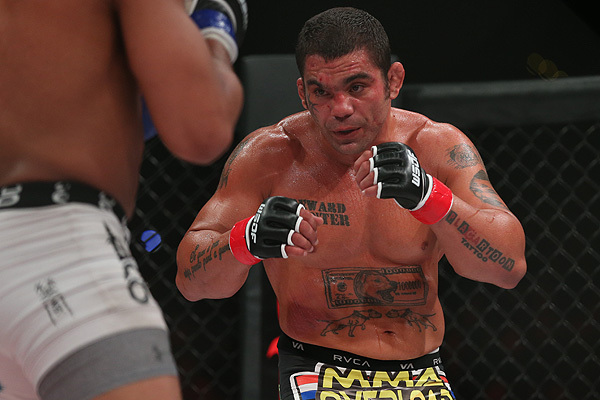 Kimball has defied those odds as of late, but Bellator may be a better long term solution should he stay at 185 lbs.